I am excited! Book number three is completed. 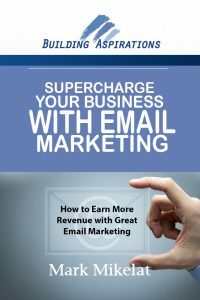 Supercharge Your Business with Email Marketing, How to Earn More Revenue with Great Email Marketing, is hot off of the presses. I would love your help in picking a cover. What cover do you like, 1, 2, or 3? Please vote by adding a comment at the bottom of this blog. 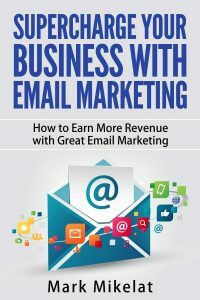 Do you need an email marketing consultation? 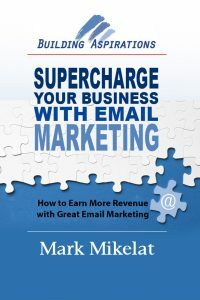 Email Marketing can really work, if you have the right partner to guide you. If you need help implementing an email marketing strategy, please click on the orange button, schedule a no-cost phone consultation with me and let us talk about how I can help you with your email marketing needs. Next steps – Social Media Success Kit. If you see the value of good social media marketing strategy, and are a do-it-yourselfer, then the Social Media Success Kit is for you. This is a comprehensive library are 20+ online courses on social media marketing topics. Once you invest in the online course, you have full access and you can view the materials again and again. Visit this page to learn more about all of the topics and resources that you get in the Social Media Success Kit. I like 1 and 3. I like the image from one (it stands out in the crowd) but I like the title lettering on option 3. And although Building Aspirations is your company name, I find it distracting and confusing and would eliminate it from the cover. Put it on the inside. Wow. Good info. Thank you so much. I like cover #3 – I prefer colorful covers! I really like the envelope with the symbols floating around it. Thanks. I appreciate the input on the colors. Number two for sure! Not even close. The title is long so it needs to be clearly legible. Placing it on a white background accomplishes that. The missing piece of the puzzle thing makes sense and is clever. The subtitle is less important but still legible and your name really stands out as well. Great comments. I appreciate . I really like number 2 for sure, but for this topic number 3 is great! Cover #3 gets my attention immediately. It looks modern and fun. If I were to see the 3 covers on a bookshelf, cover #3 would be my first pick. Great. Thanks for the help. I appreciate it. Nora, a bunch. I appreciate it. I Like 3. The colors pop and get attention. Kerri. Thanks a bunch. I appreciate the help.